3 Common Home Break-In Methods Used By Burglars | Calgary Alarm Inc.
Crime can affect anyone. It is unfortunate when crime affects you directly or indirectly—either as a victim, or as a person who’s afraid of becoming a victim—both of which reduce your enjoyment of life. Although many homeowners assume that burglars are “master criminals” who are highly organized and have access to specialised tools to get past home security systems, police crime reports suggest otherwise. According to a recent FBI crime report, the average burglar is usually a young individual looking for the easiest way to enter a home without being detected. In some cases, thieves don’t even force their way into homes. In nearly 30 percent of all residential burglaries, thieves access homes via windows or doors that were left open when the residents left. 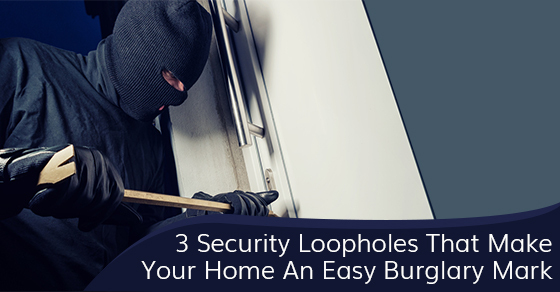 Here are some of the most common ways that burglars invade homes. Windows are the weakest opening in your home. While homeowners take comfort in the fact that the sound of breaking glass could act as a deterrent or help to raise the alarm in the case of an intruder, police reports suggest that most people ignore that sound if they hear it only once. Also keep in mind that some windows are left unlatched, while others come with weak locks that can be easily opened by a determined burglar. You can improve the security of your windows by trimming tall vegetation in your yard that may either give access to a window, or conceal an intruder trying to pry a window open. It may come as a surprise to many that many burglars simply walk up to your front door and get inside your home, but statistics suggest that it is actually very common. Data suggests that about 30 percent of burglaries are through unlocked doors, while 40 percent involve forced entry. Seasoned thieves know the usual places where households “hide” their spare key. If they are able to track your movements and know when you’re not home, they will try to find the key. If unsuccessful, they may choose to kick the door in or remove it from the hinges. A thief will try to enter your home and leave unnoticed. The invader will likely inspect all entry points, including the garage door, patio door, skylights and any other openings, for the easiest point of entry. If you routinely leave your garage doors unlocked, or ladders lying around, a burglar will take advantage of the opportunity to steal from you. The best way to protect your property from theft and your loved ones from the fear of an invasion is by installing a quality home security system. If your home has been broken into once before, reports suggest that the burglars may try their luck again soon, so it is important to contact a security alarm company to secure any points of weakness and prevent the burglary from re-occurring.